Headquartered at ranches in Bluff Dale, Texas and Lincoln, New Mexico, Cameron has been a rancher, cattleman and working and rodeo cowboy, but he decided after his bull riding days that it was horses that truly captivated him. 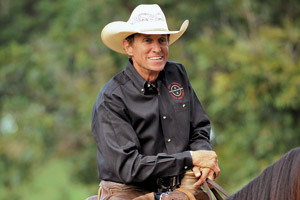 His talent and ability to communicate with the most difficult horses have made him highly sought after by television, radio, magazines, clinics and with clients from Ralph Lauren to Coach Bum Phillips. His gentle cowboy humor is compared to Will Rogers and his skill and training techniques (he simply calls it “horse sense”) keep him on the road all over the U.S. and Canada , teaching horses and their people how to communicate.